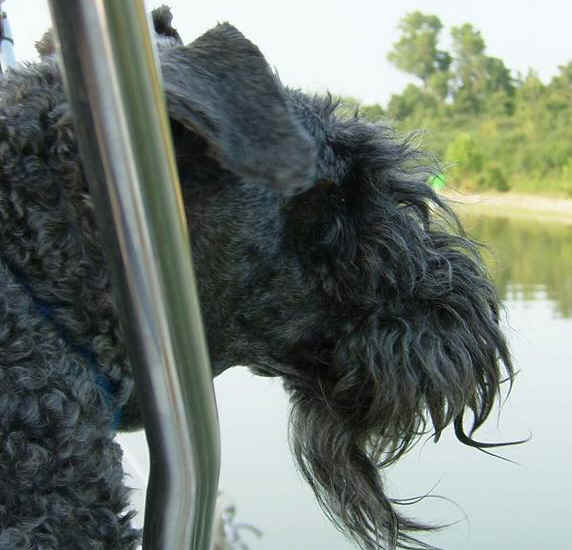 Gaelee, a Kerry Blue Terrier, keeping watch on an Erie Canal cruise with friends. Gaelee came to me in 2001 as a rescue dog. I was told her previous people thought she was incorrigible. Within three weeks, she was housebroken. She quickly racked up obedience certifications and gained her wings as a certified therapy dog. She had many friends and admirers at the local rehab center and hospice. Despite originally hailing from Texas, Gaelee never liked the heat. I thought August temperatures were causing a little lethargy. She had been seen by her vet in May and everything was fine. She was a little early for her rabies booster then so I took her back on August 29, 2007. Unfortunately, the tech gave her the inoculation before checking her lymph nodes. The reaction was immediate and life threatening. She hemorrhaged into her groin and became blind. She had to spend a night in intensive care. We weren’t sure if she would regain her sight. All that was certain was that she had Lymphoma. Fortunately, her sight returned after three days. Through talking with others, I decided not to put either of us through the expense or trauma of tests that would not impact the course of treatment. As such, she did not have bone marrow aspirations or ultrasounds for staging. She was started on the CHOP protocol. When plummeting white counts delayed treatment, we added acupuncture to boost her immune system. How she loved acupuncture! She had been in remission for 22 months when one evening, I was scratching her tummy and saw the hemorrhaging again. She was out of remission. We tried CCNU. It seemed to work but after a week, I rolled over in bed one morning to scratch her tummy and saw that the hemorrhaging was back. I cried all day knowing it was time to say goodbye. On July 8, 2009, she was euthanized by her beloved acupuncture vet. I have no regrets about treating Gaelee. Treatment extended her life almost 2 years— and they were good years. She had just turned 10 at the time of her death. She is loved and missed by her mom, her Australian Terrier brother and a feline sister. She was an incredibly gentle and sensitive girl. My 8 year old Kerry Blue Terrier was just diagnosed with Lymphoma. This time yesterday, I was taking her to the vet for a rabies booster, blissfully ignorant. All hell broke loose between then and now. She ended up at the emergency vet overnight. Saw an oncologist this morning. She starts Chemo tomorrow. I'm looking for support. Ideas on making this profound sadness go away a bit. Is it worth it? Am I doing the right thing? I really, really, really love this dog. Thanks, Carol. As it happens, the disease has blinded Gaelee and caused strange bleeding. The oncologist and my vet conferred and believe this to be a particularly aggressive Lymphoma. My vet started her on Elspar today and told me to tap into any spiritual resources I may have over the weekend. He thinks we'll have a better idea of whether this will be a reasonable course of action next week. If you care to pray for a dog, I'd love to have another person on her list. Photos attached of my girl. First off, thank you for keeping Gaelee in mind and asking friends to keep her in mind. Every bit helps. I believe you are giving her the best possible complimentary medicine. bed and she JUMPED without any hesitation, meaning she could see to make the leap and felt capable of expending that sort of energy. Some of the soreness must also have receded, just as we hoped. Keep the good thoughts coming and again, thank you, thank you, thank you from all of us here. visit. Her vision is normal again but not all of the Lymph nodes are down. The vet helped me locate the ones in her chest that are still the size of large eggs. I had been heartened that the ones in her neck had so dramatically decreased in size. He said he is a little disappointed by her response but that we should wait and see how things go after the Vincristine kicks in. because I can't imagine eating that much and not gaining weight. She sits by my side now having eaten half of her early dinner. I'll feed the rest to her by hand and plan on serving her again at a fashionably late hour. Once again, the vet referred to the cancer as 'extremely aggressive.' I asked him why he thinks it is so aggressive. Basically, because the oncologist describes it as such. Why did the oncologist describe it as such? Because of the hemorrhaging. Although my vet had never seen a dog with Lymphoma hemorrhage, the oncologist had. I told him I thought the bleeding was caused by an interaction between the rabies booster and the disease. He said it couldn't happen that quickly. I still don't think the two events were coincidental. I asked about prognosis. Dr. Friedman suggests we wait to see how she responds to the Vincristine but when pressed, said she probably has a good bit less that the original 12-14 month estimate, probably more like 6-8. Still, he stressed that this is worth treating. That was never in question. Because of your input, I insisted on having metaclopromide. At the first hint of distress, she will be dosed. We went for a cruise in my convertible on the way home. We drove by the beach and scoped out the dogs walking by. We drove by the harbor and took in the salt air. She seemed so happy, washing my ears, smiling, those grey-blue ears blowing in the wind. metaclopromide. My vet is calling on Friday so we have an automatic check in. of the other members of the group is a Reiki master! He gave me his number and said he could give her another treatment this weekend. This is the third Reiki master I have encountered who has offered to help since her diagnosis. I told him I'd feed him well with fresh produce from my garden for his efforts. I hope to convert this one into a regular thing. Despite Gaelee's food allergies, I decided to go ahead with adding a little Flax seed oil to her food. She LOVES it so, she'll be getting oily food from now on. somewhat disappointed. Too, the protocol she is the one suggested by the oncologist. My vet usually gives Elspar one day and Vincristine the next. We waited 5 days between the two drugs so it may be a more gradual uptick than he is accustomed to. Whatever the case, I am reserving judgment. Both of you have great stories. I am keeping them in mind. scare when she tried unsuccessfully to jump into my SUV, landing hard on one side. She will be helped in and out of the car from now on. Also found a mass on her eyelid this evening. She tends to be a lumpy dog and has had multiple biopsies. I'll ask the vet about it when we go back for Vincristine on Wednesday. She is my shadow. If I can't take her and it lasts more than 2 hours, I don't go. She will be going into Boston with me Saturday to paint a friend's kitchen. (I do faux paining). She will stay home without me for the first time Sunday. I'll probably be away for 4-5 hours. Realistically, I can't continue to stick this close to home for much longer. I do want to get her through the first round of drugs. We have one new one left to be administered in a little less than two weeks. I still feel an enlarged lymph node in her chest, which is discouraging. Thanks for checking in. Galee had her first doxyrubicin today so I thought I'd write. She and Flea are asleep at my feet. They both look so tranquil. Gaelee's lymph nodes are still up in her chest and groin. Since we started this, we have had to delay twice to get her white count up. survived 8 mos after diagnosis. I also have Gaelee on herbs suggested by the homeopathic vet to boost her immune system. She remains the happy, sweet girl I have always loved. Hi, I thought you might want an update on Gaelee. She is in remission and doing well. She has 3 more chemo treatments before we take an indefinite break. She will be seen once a month for check ups after that and I assume we will continue with her acupuncture. BTW, we decided to do acupuncture in the hopes of boosting her immune system so that she could stay on a more regular chemo schedule. This is not a tried and true technique but it seemed to work for us. Dips in her white count still occurred but she seemed to rebound more quickly. After the first 6 weeks or so, Gaelee seemed to be her old dog again. Save for the loss of some whiskers and some changes in her coat only I notice, she seems like the picture of health. She is my squirmy little Kerry girl. Gaelee is doing so well that she started back as a therapy dog at Hospice. I am attaching a photo of her at the Hospice house all decked out in her wings and tutu. She never fails to win a smile when folks see the elegant grey dog with the big smile in the goofy tutu. My friend's grandpuppy, Eilonwy, has now lived for almost 2 years after his diagnosis. We hope to walk together in the NYC cancer walk this summer. Las year, Eilonwy was co-queen of the walk with another canine cancer survivor. Although she is in remission now, the Lymphoma is likely to come back. We're still dealing with the 12-14 month prognosis although my vet tells me he has known plenty of dogs who have beat those odds. You just never can tell. I plan to enjoy her for as long as we are together. Thanks again for your help and advice. I will know who to contact when the need arises again. Please extend my thanks to your members for their support through Gaelee's treatment. She came out of remission, we tried a rescue protocol and thought it was working but then she started hemorrhaging again a week later. I don't think she was feeling ill yet when she was euthanized. Waiting meant risking she would bleed to death internally. I wasn't willing to do that. I thought you'd want to know. Gaelee at Hospice House a year after her diagnosis. 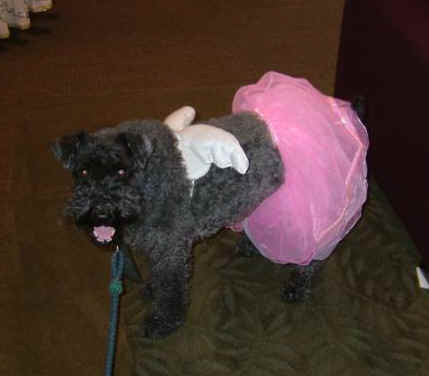 Who wouldn’t smile at an elegant dog dressed in a silly pink tutu and angel wings? 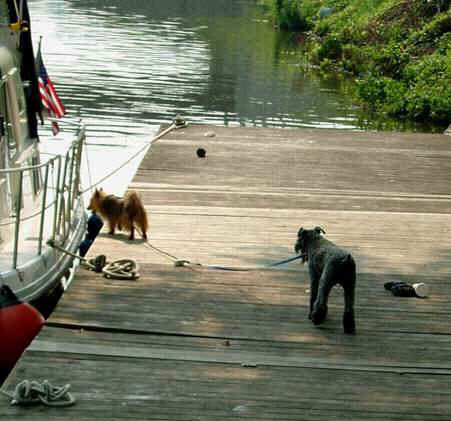 Gaelee being taken back to the boat by her brother, Flea. I tethered them together because Gaelee could be relied upon to keep Flea out of trouble and return them both when called.